His Highness Sheikh Hasher Bin Maktoum Al Maktoum, Director General of Dubai Department of Information, opened the 25th edition of CABSAT – the definitive event for broadcast media and entertainment content across the Middle East, Africa and South Asia (MEASA). His Highness toured the exhibition halls, meeting with exhibitors who have gathered in Dubai for the influential annual meet of broadcast technology pioneers, running March 12-14th at Dubai World Trade Centre (DWTC). The three-day event is the leading specialist platform for the broadcast, satellite, digital media and filmed entertainment industries. It marks its 25th year with a fresh, newly evolved format carefully devised to bring the full content creation, production, post production satellite, OTT video, e-sports, digital media and entertainment ecosystem together to both understand and grasp the opportunities that the new wave of anytime, anywhere media offers. “For 25 years now CABSAT has provided an essential gateway to new broadcasting technologies for media experts and professionals based across the Middle East, Africa and South Asia,” said Trixie LohMirmand, Senior Vice President, Events Management, Dubai World Trade Centre. Returning for 2019 is CABSAT’s influential Content Congress, which gets underway today. It will unite more than 250 creative visionaries, technological disruptors and industry influencers for active debate and discussions accounting for all channels of broadcast, and feature speakers from many of the world’s biggest media brands, including Fox International, Viacom, Starz play, CNN, Dolby and Twitter. Topics are ranging from ‘TV – a failing behemoth?’ to ‘Arabic TV – Why is the MENA region a heavy consumer of foreign content and can’t produce products that compete globally?’ with speakers including Dr. Ibrahim Abu Zekri, President of the Arab Union of TV and Radio Producers; Amanda Turnbull, Vice President & General Manager at Discovery Networks Middle East and Africa; and Raffaele Annecchino, President and Managing Director, Southern & Western Europe at MEA Viacom International Media Networks. As content becomes screen-agnostic, the latest cameras, lenses and lighting have never been more in demand. CABSAT’s Content Production pillar will showcase these very latest technologies, while diving deep into the AI, AR/VR and 5G advances reshaping the media conversation entirely. Along similar lines, CABSAT’s debut Photography Workshop will offer free to attend seminars and learning sessions presented by leading professionals. A new arrival at CABSAT, Flix on 86, hosted in collaboration with MENA TV and UTURN Entertainment will bring a range of original Arabic and international content via live cinema screenings. Flix on 86 provides a unique opportunity for creators to screen fresh content to media buyers. Screenings will include serial dramas, documentaries, comedy, kid’s entertainment, animated series and more and will be followed by brief Q&A sessions with the creators. 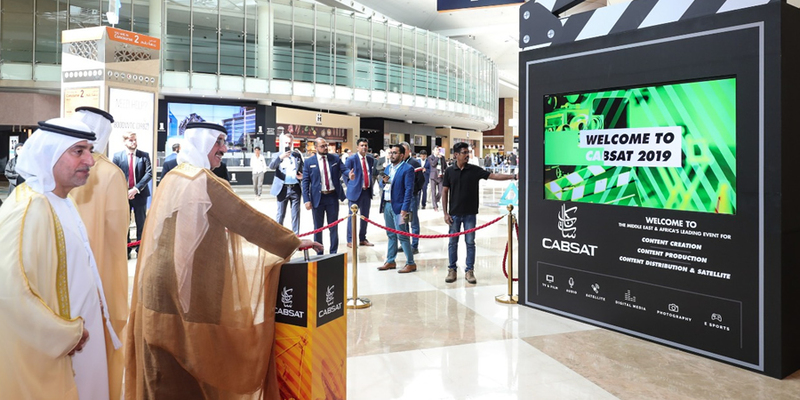 Responding to the demand of a booming new industry analysts are already projecting to be worth as much as $USD2.5 billion by 2020, CABSAT has launched an eSports Pavilion for 2019. The dedicated invite-only sector will be home to everything e-sports, with 18 leading industry experts scheduled to discuss opportunities across the plethora of original revenue generators the skyrocketing gaming phenomenon presents. The eSports pavilion will provide an unrivalled opportunity to Broadcasters, Advertising & Marketing Agencies, Premium Brands and Game Developers.